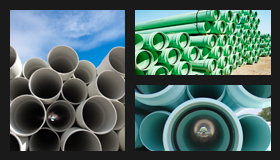 Taking the lead in promoting environmental awareness in the PVC industry. Pipemakers Australia Pty Ltd is a company committed to the continuous development in numerous areas of its environmental policies including a major focus on improved energy efficiency. As a signatory to the Australian PVC Industry Product Stewardship program, Pipemakers is highly committed to reducing the waste volume from the use of its products. Below are guidelines for where to and how to recycle, reuse or dispose of our products safely. A positive contribution to the over recycling policy is the re-use of PVC off-cuts and scrapped products. These can be ground into smaller re-usable sized particle referred to as "granulation". These "granulated" particles can be returned into non-pressure products such as stormwater eliminating the need to send scrapped PVC to landfill and reducing waste costs. Pipemakers policy aims to divert the greater portion of all scrapped material into non-pressure product. Virtually all scrapped PVC material can be diverted in this fashion using the "granulation" process allowing its re-incorporation into the manufacturing process. A strong showing of Pipemakers commitment to green policies we are willing to work with Landfill Managers in accepting re-use suitable PVC to be returned to our Acacia Ridge manufacturing plant. Although not always feasible due to associated costs often required for the cleaning and separation. Where mutually beneficial arrangements can be made. Local Government waste disposal facilities readily accept waste PVC products as they are safe to go into landfill. Please refer to local council guidelines for their most recent information relating to your particular disposal needs. Pipemakers now use Organic Stabilisers as a direct replacement for the lead base stabilisers previously used. This is in alignment with the Vinyl Council and its Australian PVC Industry Product Stewardship programme.